Clint Kuban says he “goes where the wind takes him,” and so far, it’s taken him from an undergraduate degree in psychology to a career as a veterinarian, from a simple dog lover to handler of an ovarian cancer detection dog, and from a private nature lover to a big city reality television star. 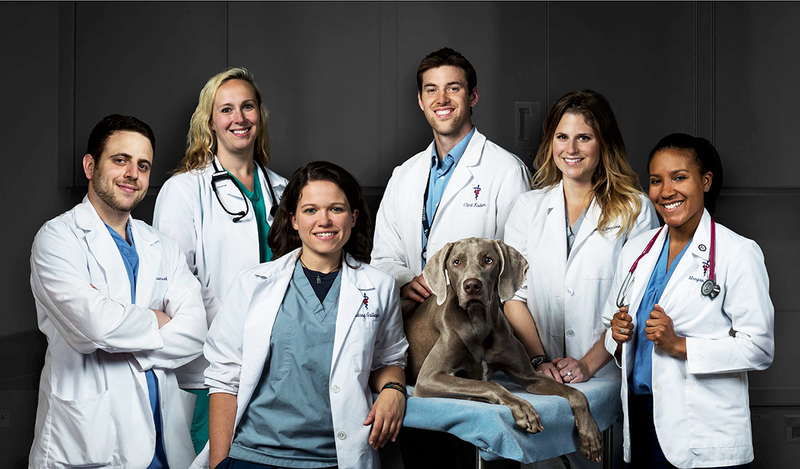 Kuban is one of six now-former University of Pennsylvania School of Veterinary Medicine students to star on Life at Vet U, a reality TV series about the lives of fourth-year veterinary students. The season finale aired November 5 on Animal Planet and celebrated the students as they graduated as veterinarians. “A few handlers were all working with her at the center, asking her to sit in front of each of us. When she came up to me and I asked her to sit, she looked up at me and I fell in love,” Kuban said. She was one of veterinary school’s greatest surprises for Kuban, a 29 year-old with a broad, warm smile, and who seems taller on TV than he is in real life. Tsunami, who he affectionately calls Tsu or even Suzie, was what kept him strongest during the times that life’s surprises turned into tragedies. During his third year of vet school, Kuban’s father died of pancreatic cancer. His father, one of Kuban’s biggest supporters throughout life and in his decision to pursue veterinary medicine, refused to let his son take any time off from school because of his illness. Kuban made one such choice to be happy when he became Tsunami’s handler, and he has dedicated the coming years of his life to Tsunami and her lifesaving career as a working dog. As her handler, he has agreed to stay with her in Philadelphia for as long as her career requires. She currently lives with him and his two cats in an apartment five minutes away from the center where he takes her to work five days a week. “They work in such harmony. Clint has dedicated so much time to help Tsu socialize and be comfortable in her own skin so that she can be successful in her cancer detection work,” Dr. Otto said. Kuban began working at the center when Dr. Otto visited one of his first-year classes looking for students to help socialize the future working dogs. When he first went to the center as a stressed first-year student, he said his work there amounted to lying down on the ground covered in puppies. He also started taking therapy dogs to visit sick children at the Ronald McDonald House where he crossed paths with Dr. Otto again. From there, he quickly became more invested in the lives of the animals at the center and the people they help. Particularly, he was fascinated by the practice of training these dogs. Despite abandoning his undergraduate degree in psychology, Kuban said it has come in handy when training dogs at the center and even in general practice as a veterinarian. During what he said was his favorite case as a veterinarian, he was able to show a nervous puppy how to trust him by teaching it a new command during a single visit. He hopes to shift the current paradigm of veterinary medicine from one where animals are restrained, examined, and sent on their way to one where veterinarians and animals work together. Kuban has also used his psychology background in a more unexpected way by diffusing emotional situations in the hospital with pet owners. “Sometimes I act more as a grief counselor for owners than a veterinarian for their pets,” Kuban said. Grief is common in Kuban’s field, particularly in the emergency room. But it’s still his favorite place to work. “Under the broad umbrella of veterinary medicine, there’s so much, from radiology to ophthalmology. That’s what I love about the emergency room. You never know what’s going to walk through that door,” he said. 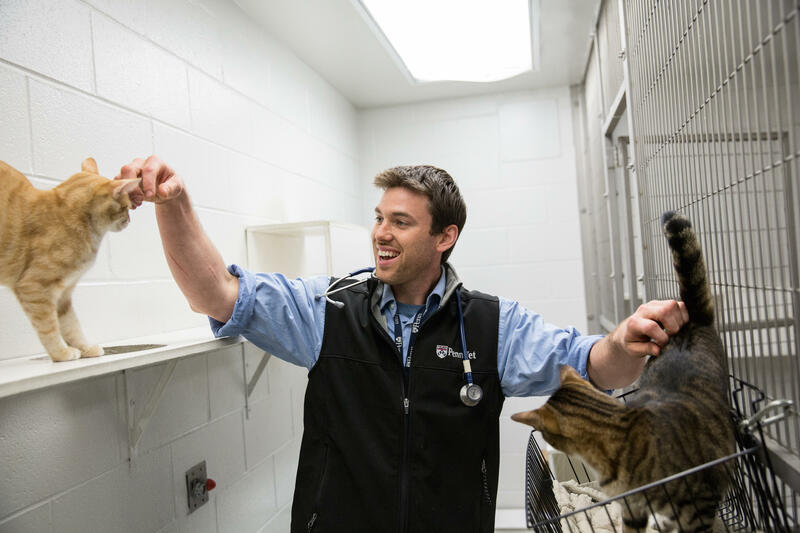 During his fourth year at Penn Vet, when students spend the year working as veterinarians of different specialties in two-week periods called rotations, Kuban elected to spend an extra rotation in the ER. “I love the pace. It’s feast or famine. Sometimes the ER is dead and you can study. Other times it’s triage after triage after triage,” he said. Kuban has almost always worked in the ER. He made his way into veterinary school by studying at night while working as a veterinary technician at the Connecticut Veterinary Center. Before that, he’d taken a break after graduating from the University of Hartford with his undergraduate degree. Instead of beginning a graduate program in psychology like he had planned, he began working at a different veterinary clinic in his native Connecticut, driving an hour each way to work as a veterinary technician. “I was basically cleaning cages, but I wanted to work with animals,” Kuban said. A year later, when his cat was stung by a bee after business hours, he discovered the emergency room at the Connecticut Veterinary Center, five minutes away from his home. 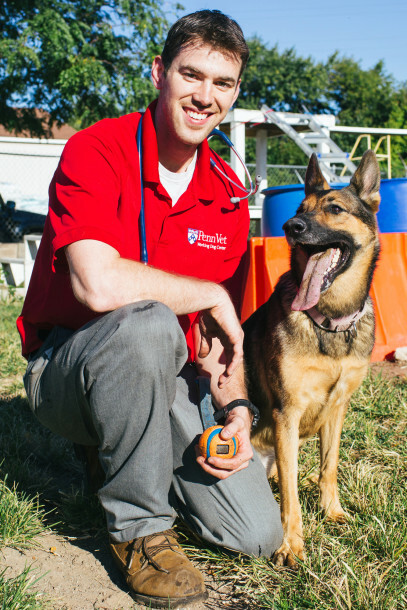 Shortly after falling in love with the emergency medicine environment, he began making moves to become a veterinarian and entered a post-baccalaureate pre-med program that would prepare him for veterinary school. Thus began a routine of dedication, hard work, and sleep deprivation that would become familiar during his next four years at Penn Vet. One of the most obvious things about Kuban is his passion. His eyes light up when he talks about the things he cares most about—the ER, Tsunami, his family, and mushrooms. Kuban is an avid mushroom hunter. He loves the outdoors and learned about mushroom hunting through internet videos. He bought a mushroom identification field guide and uses it regularly to find and identify his subjects. He photographs them with a makeshift light box and a camera given to him by Animal Planet, examines them under a microscope, and writes about them on his website. Most important of all, he uses his guide to determine which mushrooms aren’t poisonous. Then he eats them. His favorite mushroom is the chicken mushroom, or Laetiporus Sulfureus. When pulled apart, it has the texture of roasted chicken breast. “I’ve breaded them and fooled a few people into thinking they’re chicken nuggets,” he said. Kuban hunts and consumes mushrooms for the sole purpose of documentation and taste, not psychoactive effect. He said he’s never even had a drop of alcohol. Knowing which mushrooms are and are not poisonous is especially helpful in keeping Tsunami safe during their nature hikes and camping trips, during which she is his constant companion. As a veterinarian, it helps keep others’ pets safe, too. Kuban said that he saw three pets at his current job at Hickory Veterinary Hospital in Plymouth Meeting with mushroom toxicities during the past two weeks. Having a mushroom expert on staff makes identification faster and treatment easier, and he’s currently working on a presentation to teach neighboring animal hospitals how to better identify mushroom poisoning. Kuban’s position at Hickory Veterinary Hospital is an internship. For many students, an internship is the step between school and a specialized residency. Matching or failing to match with an internship can make or break a career. The first two episodes of Life at Vet U focus on matching and the students’ anxieties about and reactions to being matched. While the rest of the students look at their match results together, Kuban calls his mother on the phone and reads his with her. Of the six students on the show, two students do not match with internships. Kuban is one of them. Despite this potentially devastating blow, Kuban maintains the positivity he’s exuded through life so far. He smiles and tells his mother that, even though he wasn’t matched, he has an email inbox full of open internship opportunities. Hickory Veterinary Hospital was one of them. more surprises both good and bad like Kuban’s. He said he’s thankful to have had the experience to be featured on the show despite originally not wanting to partake—he described himself as a pretty private person. Ultimately, he said he decided in favor of showing the world the good of veterinary medicine. “And what better way is there to document your last bit of vet school?” he asked. View Clint Kuban’s website here, and watch Life at Vet U on Animal Planet!